Leveraging on our vast industry experience, we are providing a high quality range of Brass Plating Services. We have been counted amongst the most trusted names in this domain, engaged in providing Brass Plating Service. We are rendering Matt Brass Electroplating Services. Owing to their stress-free completion and timely completion, our services are immensely admired by our patrons. In this service, we do different types of printing in proficient way. 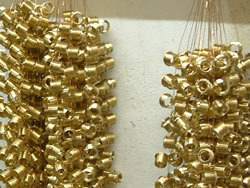 Imitation Item Brass Plating Service. Our company has mastered the art in providing Imitation Item Plating Service. It takes place in an electrolytic cell where electrolysis which uses direct electric current to dissolve a copper rod and transport the copper ions to the item. The copper rod is the anode and the item is the cathode. Brass knobs, hinges and ornamental fixtures offer the look and feel of quality when they are clean and tarnish-free. Unfortunately, the lacquer applied to shiny brass objects yellows over the years and the brass beneath tarnishes, although much more slowly than it would without the protective lacquer. As long as the lacquer remains, it is impossible to polish the brass.